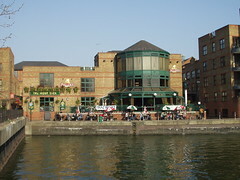 Fuller's pub on Greenland Dock in Rotherhithe. It has lots of outdoor seating, as well as a sort of gazebo-like main room with an excellent view across the dock. Kake and Sung visited on a Wednesday early evening in April 2012. There were a fair few people in, but a couple of free tables remaining. Music was playing, slightly cheesy but not too loud. Four real ales were available, all from Fuller's/Gale's: London Pride, ESB, Spring Sprinter (£3.60/pint), and Seafarers. It's worth noting that in contrast to previous practices (documented in the BITE comments and Boak & Bailey review linked below), they were happy to serve us a glass of tap water. When bob visited a few years earlier, in February 2007, the beer was decent and the food was OK. According to a sign seen outside in April 2012, food is served noon-9:45pm (presumably every day), and quiz night is Tuesday at 9pm. Accessibility: Several steps to get in, and we didn't see a ramp (though we didn't go hunting for one). Last visited by Kake and Sung, April 2012. Last edited 2013-05-10 07:35:09 (version 12; diff). List all versions. Page last edited 2013-05-10 07:35:09 (version 12).